This propellant is a bulk form of Lovex D036 reloading propellant. For loaders interested in attaining standard or +P velocities in 9mm Luger, an optimized propellant for the .357 SIG, as well as correct energy levels for cycling carbines with subsonic loads, this propellant is a wise choice for evaluation. It will also perform well with .380 Auto, .44 SPL, .45 Colt, heavy-bullet .40 S&W, and some light-to moderate bullet .357 Magnum loads. It can take your .45 Auto loads to some amazing velocities. This propellant is a good alternative to Longshot, HS-6, and Accurate No 5. 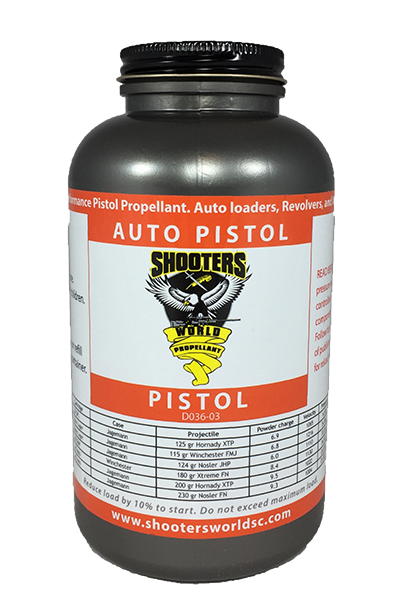 As the name says, this propellants main purpose is to enhance cycling of virtually all automatic pistols. This propellant accomplishes the task by way of optimized energy transfer, both to the projectile, and upon the firearm. From self-defense carry ammunition, to competition ammunition, to realistic training ammunition, this propellant can assist the shooter with optimized reliability. A spherical propellant, it meters through charge plates consistently and will work with a high-speed loader with very good flow. It does contain a level of flash suppressant. This propellant is a canister form of Lovex D036 reloading propellant. Ballistic load data using European CIP test methods and standards for D036 propellant is available here.